Pictured in this post is a quilt I made just as I was attempting to cross the bridge of traditional quilting to more modern quilting. I had so many "traditional" and restrictive quilting rules in my head that I thought I had to follow: always use a pattern, use fabrics only from the same line/designer, have a border, back the quilt with a print, etc. And here is the result: I have a love/hate relationship with this quilt. I am proud of it because I love the fabrics it showcases (Park Slope by Erin McMorris for Free Spirit), it is well made, it is HUGE, and I stitched the last stitch on the binding maybe 2 days before my son was born (October 2009). I hate it because it is way too busy - I guess that is the main thing that bugs me about it. It needs a neutral or two! I barely put this quilt back on my bed, on top of my liberty quilt. I needed a break from it and now I am loving it again. The pattern is Yellow Brick Road Pattern for Atkinson designs. It measures 93 x 102. Thanks for stopping by! I love your quilt! It's not too busy and the colors are beautiful. I can't send quilts off to the longarm quilter all the time either, so have started making smaller quilts and/or quilt them myself even if they are not perfect. I love this quilt! I don't think it is too busy at all. I love all the colors. 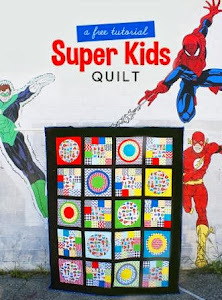 I only send out my really big quilts to the long armer. And not that often either. You should jump right in and try quilting one of those tops yourself. You'll be happy to be using those quilts, even if they aren't exactly the way you want. Some of my earliest quilts are not quilted well, but they are well loved. 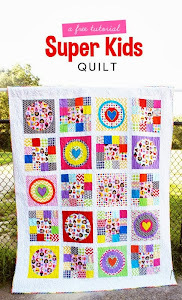 I totally LOVE this quilt! The colors are wonderful. You did a great job! I told you it wasn't too busy!!! I'm glad that others agree. I LOVE this quilt and I think it's my most favorite of any you've done! Love, love, love it! I'm so glad you posted it on here. Beautiful quilt. Not too busy at all, or maybe that's just coming from the queen of busy quilts. Regardless, I think it looks great. All those fabrics that you chose are wonderful! Great work and that was a great choice in the pattern, too! This is a GREAT YBR quilt! I don't think it's busy at all; in fact, find yourself another long arm quilter, should you decide to ever go back to one. If you have a flickr account, there is a YBR group there, and you can put your picture in that group. I feel your pain on the whole quilting issue. Paying a long arm quilter to quilt tops for you IS expensive. Yet forcing a large quilt thru your own home domestic machine can be difficult to impossible. Can you rent time on one? I found 2 long arm machines in my area that rent out time. I think that is one of the prettiest yellow brick roads that I have seen. I have made some myself, and I like the pattern. I bit the bullet and started quilting my own quilts. I got a Juki TL98Q so I'd have a couple extra inches and have done probably about 30 now. It's more than paid for itself. I'm still not a great quilter, but the people who have received them like them, and I am getting a bit better. So far I just do meandering, I wasn't blessed with artistic talent. I got a dvd from Patsy Thompson Designs to help with the mechanics and have done ok with it. Basting was my mountain to climb, DH had pneumonia, no spray, I run over the safety pins, and so I do Sharon Schamber's board basting method and it works well. The thread basting takes awhile, but again I bit the bullet made myself a little kit and I don't really mind it now. I have almost finished my UFO's. Good luck with it.